Disclaimer | The Law Offices of Shawn M. George, Esq. The Law Offices of Shawn M. George, APC (the “firm”) provides this Web site and the information on it for general informational purposes only. The information accessible on this site is not, and should not be relied upon or regarded as, legal advice. No one accessing or reviewing information on the firm’s Web site, whether or not a current client of the firm, should act or refrain from acting on the basis of such information, without first consulting with and engaging a qualified, licensed attorney concerning the particular facts and circumstances of the matter at issue. The Law Offices of Shawn M. George, APC expressly disclaim all liability in connection with actions taken or not taken based on any or all of the information accessible on this Web site. Operation of the firm’s Web site is not intended to form, and will not create, an attorney-client relationship. Any person who accesses information on the firm’s Web site and/or who unilaterally communicates any information to the firm or any of its lawyers or agents should not expect that an attorney-client relationship is formed or that the firm owes such person any professional duties owed to a client or prospective client. 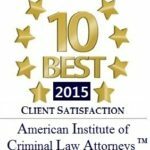 Contacting the firm through the Web site, by email or any other means does not create an attorney-client relationship with the firm or any attorney associated with the firm. Any information on the Web site about prior results attained by the firm or its lawyers is not a guarantee or warranty that a similar outcome will be achieved.